According to KPCB, by the end of 2017, online video will account for 75% of all Internet traffic. Syndacast reports email open rated increase 19% when the word “video” is in the subject line and having a video on a landing page boosts conversion rates by 80%. DMB Adobe says that online shoppers who watch a demo video are 1.81 times more likely to buy than those who don’t watch. Video viewing is increasing not just on desktop computers but on mobile devices as well. These stats suggest that video is a valuable and effective tool for attracting customers and converting them to buyers. Unfortunately, many home-based entrepreneurs are nervous about using video or believe the process is daunting and expensive. Like most technological resources, video creation has become easier and more affordable than ever. Today, there is no reason to start using video to market your home business. Increasing rapport and trust. People feel more comfortable with the businesses they see and hear. Increasing repeat buyers and referrals. Through video, you can ensure people are using your product and service correctly, which improves customer satisfaction that leads to repeat buying and referrals. Improving SEO. Search engines love video. Especially if your video is on YouTube, which is owned by Google, having a video can be an effective part of your SEO strategy. Increasing social shares. People are more likely to share video than other forms of content. Precision Marketing Group indicates that 92% of mobile users share video content. Building an additional source of income. You can offer your video for free on YouTube and still earn money. Introduce yourself: Videos is a great way to welcome people to your website and have them start to get to know you. Day-in-the-life: These videos are little windows into your business. Q and A to answer your market’s questions. Testimonials: Clients and customers can share their positive experience with your business. Customer thank you: Let your clients and customers know you appreciate them. Customer-generated video: You can survey your customers, or get videos of them using your product/service. Lead capture: Instead of just have a form and text, you can include a video to let people know what they’ll get if they sign up for your list. In fact, you can have a video as the lead magnet that you give away when they sign up for your list. Sales: If you have a product to sell, you can use a video as part of the sales process. Record events: If you attend a conference or tradeshow, you can video your talk or presentation, record visiting other events at the venue, interview attendees and more. Record screenshots: Recording what’s on your screen offers opportunities for tutorials or tours of your product/services or website. Webinars: Webinars are an extremely popular marketing tool to attract potential buyers. They can also be fee-based events. Courses: Create and sell a course, including video tutorials as a method of teaching your ideas. Vlog: Instead of blogging, consider videoing your message. Livestream: Many social media platforms now offer live stream video where you can capture a spontaneous moment in your life or business to share. Microphone to enhance the sound. You can get microphones for your computer and smartphone. VoIP video recording or online web conferencing. If you’re doing an interview or holding a webinar, you’ll need a service that can not only connect you with other people but record the event as well. Editing software. Some computers, especially those with webcams, come with basic editing software. Many people like Camtasia, which offers a ton of bells and whistles. There are less expensive options as well. You can also get video editing apps on your phone. Photo editing. For logos, title frames and other graphics, you may want a photo editing software, or you can use an online option such as Canva or PicMonkey. Royalty-free video, graphic and music stock. Lightening. Depending on what you’re shooting, having good lighting can help perk up a dull setting. Tripod to hold the camera. A document camera or adjustable phone clip holder (less expensive). If you ever want to video with your camera facing down, for example, you’re writing on paper, a document camera or clip phone holder is ideal. Video hosting. YouTube is free and has the largest reach. However, there are other video hosting options you might want to consider depending on your goals. For example, if you want to have the video on your site without the YouTube logo, you can use Vimeo. You can open up the video recorder on your phone, shoot a video and upload to YouTube in a matter of minutes. 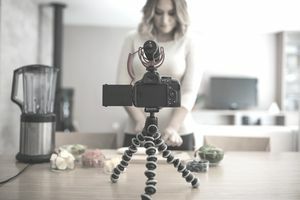 However, if you plan to make video an integral part of your home business, there are a few things you should consider. Who is your audience and what do they want? Give your market something of value. This will not only increase the chance that they’ll buy but also, that they’ll share your video with others. Plan your video before shooting it. The video is best when it’s succinct and to the point, which is best done by deciding what you want to say before you push record. Be authentic. You might feel strange on video, but being yourself is crucial because that’s ultimately what you’re selling…You. Tell a story. Your video should have a start, middle with rising tension, and a resolution at the end. Have a goal. What do you want your viewers to do following the video? It can be to sign up for your email list or follow your YouTube channel. Always have a call to action for viewers to do. For longer videos, change views and angles. Sitting in one position over many minutes can get boring. Instead, create interest by using different shots or integrating graphics and other features. Use the same branding (logo etc) as you have on your website and other business marketing materials. Don’t forget to include your website URL in the video. Embed your video on your website. This will increase interest and engagement on your website. If you built your site with WordPress, you can use a plugin to have a video gallery of all your videos on your site. Use keywords in your video titles and description, just as you would for any other content to maximize SEO. If you’ve been resistant to using video, now is the time to overcome your hesitation. The video is too powerful a tool and is only going to become more popular and expected by consumers, to not add it to your home business. How Do I Find Network Marketing Team Members?